You can't sustain a book or a story without compelling characters. Vivid settings are good. Clever plot twists can keep people engaged. But if your reader can't identify with your characters, can't find something to project themselves on to, the game is over before it's started. David Corbett has written incredibly rich characters in novels like The Devil's Redhead and Blood of Paradise. And he's an immensely-talented teacher, with the ability to deliver writing lessons in a clear, in-depth manner. 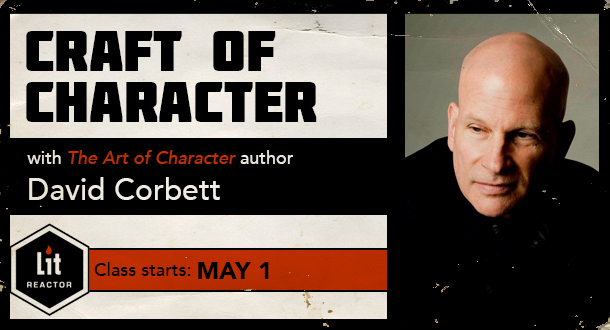 This four-week, hands-on writing intensive is a practical lesson on how to craft compelling characters and bring them to life on the page. In this course you'll explore the dramatic roles and functions that characters can assume in a story. Then you'll learn how to shape language to depict that variety of characters. Finally, you'll develop techniques for creating compelling scenes and fluid dialog to make those characters come to life. Along the way, David's writing assignments will guide you in putting these tools into practice, and his detailed review and insightful analysis of your work, in addition to helpful critiques from your classmates, will solidify your command of the material. In addition, opportunities for questions and discussion will be available throughout the course. Reader engagement depends on character empathy, and that requires strong point-of-view characters with a controlled, consistent perspective on the story. Language creates the bridge between those characters as envisioned in your mind and the ones on the page, and shaping language to reflect character is key to effective drama. How to fashion the protagonist and opponent to maximize conflict and thematic richness. How to determine whether the protagonist faces an actual exterior opponent or instead faces a problem, an enigma, or a disaster—and how to craft the conflict if no opponent exists. How to embody the premise in the protagonist, and the counter-premise in the opponent. How to structure the story based on the core question asked of the protagonist. How to create compelling opponents who don’t fall into cliché, who honor the writer’s thematic intent, and who serve to enlarge the protagonist, thus enhancing the dramatic force of the story. How to create nuance and subtlety in the main characters, serve the hinge points of the plot, and bring to life the story world through the creation of compelling secondary characters. How to identify your point of view characters, and how to control language to craft scenes from their perspectives to enhance reader engagement with the story. How to use attitude, rhythm, tempo, and color—voice—in the service of characterization.